I purchased the book so I could see what info SD had that may help in my research. I do see many things I did not know about, but I also see things that are a bit different than SD sees them. Let's take for instance.... 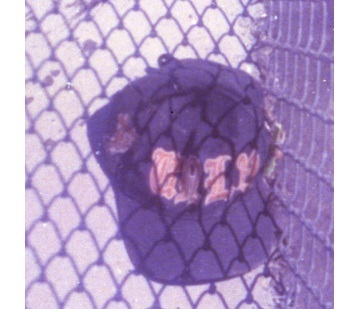 The baseball cap he declares reads "UNLP" and compares it to script found on a logo that he takes to mean it comes from a university inside the Bay Area. I see it different, and so did my cousin. This is what he came up with, so I though I would have others weigh in.... I can't stand to see good information disseminated by people who do not care to do the actual legwork it takes to make identifications. My cousin happens to be a huge baseball and sports fan who recognized immediately that this was a UNLV hat for the Running Rebels. Below find the mascot which appears to be identical to the logo found on the left side of this hat. You can see the posture of the figure is correct with the lean in his stance. The rifle is barely visible, but definitely there. With Jack's attachment to the Nevada and Las Vegas area, I believe that this theory fits much better. There are several versions in different colors, so don't let the color theme throw you off. This is just the beginning of skimming over the contents. What it's all supposed to mean, is something that I currently don't know? I've often wondered what he meant by the "Rebels" remark on this odd document. It's like it's some kind of an inside joke. If I recall correctly, it's at least the second document where he threatens to kill little children. I do, it ties him back to the California Nevada area. Like I showed in the Atlanta, GA killer thread that the postage stamps on this very letter matches one sent in California about Herb Caen. It is all a cross connection and many of these facts will be out soon for everyone to follow. These connections are made in the 1986 letter about his activity all over CA and NV. That letter is a mere 7 years after the letter you posted above TerryB. Trust me, I have all this and 1,000's more as connections. Now, to figure out when the attack on the unsuspecting ball cap wearer occurred in context to the letter about the rebels. Nanette: "Buy the way" is to my current way of thinking, a strong hint that he's dropping here. It's like he's joking about all of us "buying" into this scam. For instance and from the Ramsey note: "You will be scammed" might be his ulterior message vs "scanned". I say this based on an experienced overview of everything that we've come to realize about Zodiac Jack. Otherwise....absolutely.....you've called this evidence correctly and Dewhurst obviously hasn't. Perhaps I should also get a copy of his book? It's just that I'd feel sidetracked with what I'm currently studying. Anything that you care to share here about his book is greatly appreciated. LS hasn't won enough of my interest just yet to fork over money for his book. If I study his stuff, then I'll have to become an expert on what he's doing in order to see if he's made the "evidence fit the document" or visa versa? If you get my meaning? I'm not declaring him faulty, I just honestly don't have enough of an overview of all of his workmanship and methodology, in order to endorse or nix his work. The phonetic Jacd tarrowance (sic) thing was intriguing, wasn't it? Buy the way (ha ha ha), wasn't there something fuzzy about Dewhurst's dealings with Dennis Kaufman? Or maybe it was "on" Dennis. There was some dispute about some pictures, as I recall? Dewhurst is actually sharing some very good information that I was not privy to, or at the time it didn't seem to have any bearing, and I dismissed it until now. Things like Jack flying with his friend and assisting him in obtaining his flight hours to receive his pilots license. This is damning news when we know that there was air flight detected in the pattern of the Cooper caper previous to the hijacking. Also, I was under the impression that Arthur Lee Allen was a pilot as well. Maybe he had more to do with this group than could be detected. Jack did say that Allen was the nice man he met and whom had given him a ride home. There is something fishy there about Jack evening being an acquaintance of the number 1 Zodiac Killer suspect. Making that patsy I bet.... I bet that Jack practiced this jump with his friend and maybe even Allen.